She may have become known to many through her work on stage, but 2013 has solidified actress Renee Lawless as one of the unforgettable stars of the runaway hit The Haves and the Have Nots. Through the show The Haves and the Have Nots Tyler Perry has created a cast of characters that know what it's like to be one thing in the public and another in their everyday lives---and we can't seem to get enough of it! Since May 28th Tuesday nights have not been the same, and actor Gavin Houston who is bringing to life Jeffrey Harrington couldn't agree more. From episode one millions have been captivated by the show, and Jeffrey's seemingly perfect house of cards as been shaken. Gavin talked about the show's success, it's cast and the experience in this conversation. "There really is something that everyone can relate to. The things that the individual characters are going through are so much like the issues of our fans. I couldn't have imagined all the things we covered: politics, things going on with the family, sexuality...this whole season is so packed with so many story-lines going on that anybody can find something for them. We all have stories to tell. The show really explores who truly has and who truly have not. It's been really interesting to watch it unfold and get more in-depth. It really shows that all that glitters is not gold." "I love this responsibility to bring the character to life. Alot of it is about promoting acceptance. One of the biggest things is acceptance from your own parents. Jeffrey shows the extremes that people will go to in order to find love is what makes it a great story. What he's going to do and how it ends is going to blow people away." 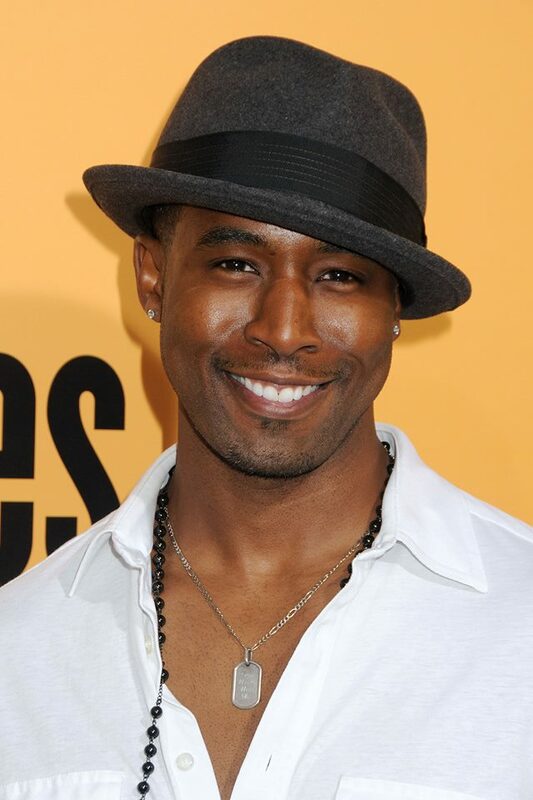 Regardless of whether or not Jeffrey finds the courage to walk in his own truth or not it's obvious that Gavin Houston is moving full steam ahead in doing what he loves. As he says "Persistence overcome resistance and as long as we push forward success is sure to be ours. Stay in touch with Gavin Houston at www.twitter.com/gavinhouston and use the hashtag #HavesandHaveNots. When Tyler Perry's THE HAVES AND THE HAVE NOTS debuted on the Oprah Winfrey Network on Tues. May 28th with over 1 million viewers tuning in I wasn't surprised. Not only is he an amazing storyteller, but I think we all knew that OWN's first scripted series was going to have something that audiences of all backgrounds could appreciate---and we haven't been disappointed yet. My first interview with the cast of the show was with actress Jaclyn Betham who plays Amanda Cryer. Though I have never talked with her before I was familiar with her work from the film QUIET with actress Susan Graham. I knew that she was someone to watch, and in her new role she is definitely not disappointing. The first question I asked her was about the show's response. "I was really excited," she told me. "When you shoot a pilot of a brand new series you're kind of scared. You don't know how it's going to do. When we found out it the response it felt good. You want people to watch your work. When they do you're super excited." When I brought up the appeal of the cast and the show, Jaclyn agreed with the universal message. "I think that everyone sees themselves in one of the characters," she explained. "With Mr. Perry there is always a message, something you can relate to. I think that was a great process to be a part of, too. With each episode there 's a greater message at the end of the day. What more can an actor want!" Jaclyn told me that this is exactly the path she wanted for herself. "I had this dream that I was working so hard for. Once all of that pays off you sit back and say 'This is happening.' For me I had to embrace it. It's so clear to me that your dreams can come true if you have the dedication and the drive to push for your dreams. You just have to make it work." Part of what has made this journey an amazing on is the cast on the new series. "I've heard horror stories about working with casts on show," Jaclyn told me. "I'm so happy that is not the case with us. We are all very close. It's like a second family. I think that's why we can be so nasty to each other on camera, because we are so close. I couldn't be luckier to be a part of this cast." Bringing Amanda Cryer to life was a lot of fun for Jaclyn because of her complexities in life. "I think for her she's never made a decision in her life. Amanda has been crying out for attention and wanting to be her own person for so long that finally she's like 'Listen to me.'" Ironically the character that many have grown to love to hate to love Candace (played by Tika Sumpter) gives her the strength to try to stand up for herself. In Season One of The Haves and the Have Nots we have gotten a glimpse into Amanda Cryer's life, and through her portrayal of that character more of the world has gotten to know Jaclyn Betham. When I asked her what was it like to interact with her fans since the show began Jaclyn says at first it was "kind of a weird process," especially adding the world of Twitter to her routine. "I was really into Instagram before the show," she explained. "Now I'mm kind of getting used to responding to the fans. People are interested in what I'm passionate about, and I'm happy to talk about it." Jaclyn's advice those who see themselves in Amanda is this: Realize your truth. "I think that honesty is so important. Living in your truth is essential. You'll never be happy if you don't." Stay in touch with Jaclyn Betham at www.twitter.com/jaclynbetham and make sure to use the hashtag #havesandhavenots. His real name is Nathaniel ‘Paul’ Jones. His middle name is not even Pierre, although he’s more known to others as DJ PIERRE. Besides a deejay, he is a music maker and people mover. Pierre was a name given to him by his youth Pastor in the Catholic Church he grew up in. They all went by Saint names in church and his was Peter, but he thought that being called Peter wasn’t cool. So they said how about Pierre – It’s Peter in French. “So I was like, yeah I can work with that. So everyone in Church started calling me Pierre and that’s when I adopted the name. I’m now no longer Catholic, but the meaning behind the name is still valid”, stated DJ PIERRE in his introduction to this interview with Ramona Portelli for Conversations Magazine. DJ Pierre was born in Harvey, Illinois that is a suburb of Chicago. His uncle Nathaniel Jones, whom he was named after, once played with Duke Ellington and his band. Music had been part of his life from early on. All of Dj Pierre’s six siblings, played some sort of instrument. Dj Pierre played drums and clarinet. He was in the marching band where he played the Tri-Toms. “We won a major drum competition in Canada," says Pierre. "I think I was about 15 years old. So that re-enforced strongly my belief in music and what can be accomplished if I applied myself. So that re-enforced strongly my belief in music and what can be accomplished if I applied myself. I now live in Duluth, Georgia, which is a suburb of Atlanta. I’m married and have 4 kids, 3 girls and a boy. Last two girls Nia and Nylah are with my current wife." You are the creator of acid music. In your own words, can you describe what exactly is acid music? Acid House is freedom to create and explore. Acid House is boldness to declare this is music as well. There was nothing else like it in our world before Acid Tracks. So it was bold…it said you will accept me despite being different. I am music and I can be felt and I can cause people to dance and go nuts. Basically you gave birth to a genre and pioneering a sound that had the whole world dancing and imitating for over 20 years. How did you first discover you had a talent for deejaying? Music has always been a part of me. But I used to listen to the Hot Mix 5 on the radio and would attempt to record the songs they played and mash them up to make the flow that I wanted. I’ve always been intrigued by the rhythm of an entire set and how it can leave you feeling nostalgic, hyped, inspired, sexual…it goes on. So I asked my dad for some turntables and it started from there. I turned my garage into a DJ set up. You are a founding member of Chicago group ‘Phuture’ with Spanky and Herb J. What is Phuture, and what is your role? Phuture began with Spanky and myself. We started out wanting to emulate those we respected. We found out that we could do more than that. Spanky programmed most of the drum patterns and I wrote the lyrics, programmed most of the Acids and did the arrangements of the songs. By time you got to know about the ins and outs of the Chicago House scene. Soon you were spinning at parties and Chicago clubs. By the late 1980s, you were considered to be one of the best DJs in the area. What are your comments about this nice reality? Every time I go back home, which is often, I have another memory or moment where I recall a DJ battle I won. I mean there must have been a divine hand in my development because it’s like I was born for this. I won most battles in my area and would DJ on 3 turntables. Then I was Scratching Pierre because I would push the boundaries scratching and looping and all that. I outgrew the suburbs and looked towards Chicago the big city. And one of the biggest DJs at the time in Chicago opened that door. Lil Louis gave me a chance to open up for him at the Bismarck. And that made a lot of people ticked off because I’m from the burbs but I’m DJing one of the biggest parties in the city. That’s the kind of mentality in Chicago that prevents growth. It’s crazy but it didn’t stop me. I’m honest about that reality. I love Chicago. I love even the environment I came up in. The good and the bad; it made me who I am today. So I’m very humbled when look back at everything. I know I was one of the best, but I hardly stress that or even think about that. I mainly think about my inspirations like Marshall Jefferson and Lil Louis, Hot Mix 5. That’s what comes to mind when I go back to play Boom Boom Room or the other events Joey Swanson does there. You are one of the most in-demand producer and deejays. In fact, you are constantly sought after Europe, playing regularly in Germany, UK, Italy, France, and you’re a staple at the clubs in New York City. How do you normally relax, and get away from it all? I balance it with studio time. The studio is like therapy. When I’m out of the studio too long, even if I’m not working on track as yet…even if I’m in that place waiting for the inspiration to kick in - it’s therapeutic for me. My spiritual journey is also a balancing force as well. I now see life differently and my role as well. I’m here because my creator destined it so. So my life is not my own. So when things get crazy I remember that I’m here serving a purpose for the greater good using music as a tool. You are the CEO of two labels. Afro Acid and sister label AA Trax. Can you let my readers know more about these ventures of yours? I’ve got a strong team now helping me run both labels, whilst I concentrate on my heavy touring schedule, which is a good thing as I can concentrate on the gigs, whilst the team and my new management can get on with the business stuff. We have some great new releases coming out and I’m quite blessed to be able to work with so many talented people. The philosophy on both labels is to be able to release tunes that make us feel good, make us dance and allow us to be express who we truly are, which is one united spiritual family. How many years have you been deejaying, and where do you play most? About 30 years. I’m mostly in Europe. The UK is my biggest territory. I play there the most. I’m in Italy a lot recently and places like Holland. I’m there a lot as well. In the USA I’m in Los Angeles/San Fran few times a year along with New York and Chicago. Smaller areas outside of that too. Can you name some of your best tracks you are most famous for? Of course, Acid Tracks, The Horn Song, Master Blaster, Switch 2001. How would you describe your tracks? Edgy, energetic, daring and a fusion of different elements. I don’t like to be boxed in so you will find different elements in my tracks or you will find me doing a house track or wild Pitch track then next track will be full Electro. Yeah working on a bassline for a Laidback Luke/Pierre collab. Other collaborations I have to get to are with Maceo Plex, Hoxton Whores, Judge Jules, The Orb and a few others for release. I’m also working on a remix for a friend Tom Stephan and have a few other remix requests I need to get to. Can you describe your state of mind when deejaying in front of a big crowd? Out of body…can’t put words to it. When you connect with the crowd and they trust you, you can tell them anything through the music. It’s like going to a therapist and being able to tell you innermost secrets knowing they are bound to listen and not judge and just accept you for you. That’s the audience for me. They give me the opportunity to tell them my story….what I’m feeling at the moment. Love - It conquers all. Is there a down side to your fame? There is a downside to a certain degree of success. Once you hit a mark, people will want you to repeat it and repeat it the same way, without realizing the public may not want it the same way. So when certain of my tracks got popular people did not want me to deviate from that mold. And I was growing so there was some conflict there in my earlier years. But now it is what it is. You either take it or leave. Still love. What’s the best prank you’ve ever pulled on someone? I can’t even recall. I’m sure there is something. But I’ve done a lot of silly things back in the day. I would even go as far as to say they borderline vandalism. So can’t go into that. My glasses! I used to lose about 2-3 pairs a year. Over the years I would have had a huge collection. Now I have about 3 or 4 pairs I go back and forth with. I usually buy Gucci, Burberry, Prada and Versace. Ray Bans as well for chilling when I’m not touring or driving on a sunny day. Just to be even more of a balanced person spiritually. I want to reach that place where I fully understand who I am as a spiritual being. Then the rest will take care of itself. DJ Pierre – Thanks for your time for this interview with me. What are your comments for Conversations Magazine readers? Thank you for your time. Final words would be pay it forward. Do something good for someone just because you can. Then hopefully they will be blessed and inspired enough to pay it forward as well. One love. Life doesn't come with an instruction manual. This means we each get to assemble our own; one that can be customized, updated, and overhauled at will. How empowering! In this column, we'll explore ways to promote positive growth via books and programs on success and personal development. Note: Originally published in 1989, The 7 Habits of Highly Effective People: Powerful Lessons in Personal Change, is still ranked in Amazon's Top 100 Books, and in Amazon’s Top 10 for the categories Self Help and Business & Investing, as of July 2013. The late Stephen R. Covey, Ph.D. – businessman, teacher, author – amassed an amazing list of achievements, awards, and honors during his lifetime, including recognition as one of Time magazine's 25 most influential Americans. While Dr. Covey published a number of bestselling non-fiction titles - Everyday Greatness, First Things First, The 8th Habit, to name a few - the phenomenal success of The 7 Habits of Highly Effective People remains a pinnacle of accomplishment with 25 million copies printed in 38 languages, worldwide. And it’s still a top seller. The audio version of The 7 Habits of Highly Effective People has sold 15 million copies to-date, making it one of the bestselling nonfiction audio-books in history and the first nonfiction audio-book in U.S. publishing history to sell more than one million copies. The 7 Habits of Highly Effective People: Powerful Lessons in Personal Change is a principle-centered methodology that can be applied personally and professionally to resolve problems, strengthen talents, and make the most of life’s opportunities. Many people are familiar with a few, if not all, of the individual habits. The complete list follows, but don’t let their brevity fool you. In the book, Dr. Covey expands each habit, giving it an uncommon depth and breadth. Designed to be studied and adopted sequentially, the habits build on one another. The habits are grouped in a multi-tiered hierarchy that moves a person from dependence, to independence and interdependence, by looking inward at the individual, then shifting outward to the environment. The first three habits are called “Private Victories” and deal with self-mastery, strengthening and defining the reader’s character base. Habits 4, 5, and 6 are “Public Victories,” with a focus on teamwork, cooperation and communication. The 7th habit is a process of ongoing renewal that encompasses all the other habits, while spiraling upward toward perpetual improvement. Graphics and tables visually enhance the text. Each habit is defined and explained in straightforward language, with plenty of examples and anecdotes. The chapters end with Application Suggestions, a series of practical, proactive exercises to help implement the habit. · Part One: Paradigms and Principles: an introduction and overview of the habits. · Part Two: Private Victory: introduces habits 1, 2, and 3. · Part Three: Public Victory: covers habits 4, 5, and 6. · Part Four: Renewal: looks at habit 7 and how they interrelate. 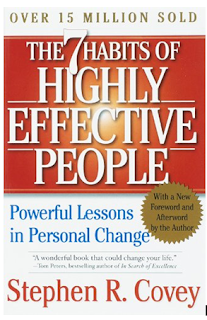 The revised (2004) edition includes a foreword with Dr. Covey’s thoughts on the timeless relevance of The 7 Habits of Highly Effective People. There is also an afterword where Covey gets personal and tackles the most frequent questions asked since the book’s release. I liked the question about which habit Dr. Covey personally had the greatest difficulty with. To learn that the process was ongoing for him was heartening. The one line which seemed to sum up the book’s premise is from the foreword: “If you want to achieve your highest aspirations and overcome your greatest challenges, identify and apply the principle or natural law that governs the results you seek.” That’s exactly what the 7 habits do. The number itself - 7 - is an amenable, doable quantity – emphasis on doable. Action is required. Knowledge alone is static. Wisdom, however, is personal. Wisdom is mixing knowledge with action and experience. The 7 habits are a solid way to develop principle-based personal power. Mastery of the habits entails practice, application and feedback – all the usual requirements for distinction. How to begin to implement the habits in today’s busy world? Start with one of the exercises suggested for each habit. Or concentrate on one habit for a thirty day period. (Imagine your life seven months later!) You could also blog about your experience with each habit. Public commitment is a powerful way to stay the course. Bonus! Here’s a cool tool: Visit www.stephencovey.com and register to join the free online learning community. As of July 2013, the community had over 270,000 members. You’ll find videos, exercises, planning tools, and forums. Groups are available, with interest categories ranging from body goals, to geographical areas, to company groups. You can also connect with people who share your interests and invite others to join. Keep a highlighter and pen handy to note passages that speak to you. This book has a number of useful charts that can be utilized immediately. One of my favorites is the Time Management Matrix, which categorizes activities in four quadrants of importance and urgency. In addition to the print and digital copies, the book is available in audio and DVD versions. For those who like a hands-on approach, The 7 Habits of Highly Effective People Personal Workbook is available. Two additional titles that expand on the 7 habits are: Living the 7 Habits: The Courage to Change and The 7 Habits of Highly Effective Families. There are also specialized audio programs including: The 7 Habits for Managers, The 7 Habits for Network Marketing Professionals, and The 7 Habits of Highly Effective Marriage. Franklin/Covey, a business Dr. Covey co-founded, offers a number of live and online workshops based on the habits. Highly recommended. (Yes, that’s all you’ll find here. The best, for the best.) The 7 Habits of Highly Effective People: Powerful Lessons in Personal Change is a thought-provoking book. It asks you to work on yourself first, to assess habits and processes before delving outward in committed change. The trajectory of that change will be meaningful and personal. The path of individual excellence is different for each of us, but the destination is the same: the top. Chapters range in length from 55 pages to 21 pages. Graphics and tables are sprinkled throughout the text. WorldCat.org lists over 3600 libraries in the U.S. with copies. The copy reviewed was purchased by Kathy Holzapfel. No material connection.